We're parked up for the next few nights at the Wild Atlantic Way campsite in the village of Creeslough, and after nearly 3 weeks of abstinence we mounted our bikes again today and went out for what became quite a daunting 1st ride. In all we managed about 32 miles, but I'd swear more than half of it was quite steeply uphill, and therefore, although the scenery was stunning it would have been unlikely we'd have made it that far without the frequent assistance of the batteries on our bikes. We've left the Inishowen peninsula behind now and we've passed by Lough Swilly and entered the Northern part of Donegal, so our target for today was the craggy headland of Horn Head. 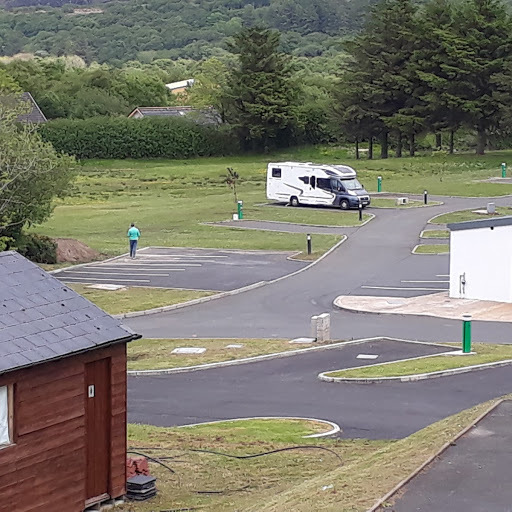 It lies just north of the town of Dunfanaghy and to get to it we were required to climb the narrow winding lanes that no motor home should dare to wheel over - but a few did! However, we were sensible and climbed to the top of the huge shear cliffs on our bikes, and although it was fairly hard work we were well and truly rewarded eventually! When we arrived at the end of the road leading to the Head we were initially a little disappointed because the rain was starting to pitter patter and the unpaved path was to rough to take our bikes over so we really thought we were going to miss the best bit. But as we started our decent we noticed a loop road that would take us out to a view point that actually looked back over The Horn's Head outcrop, and although it meant another episode of climbing, the effort was more than worth while for the views, and also the fast decent that provided excellent fun providing you missed most of the pot holes! On our return journey we also visited Ards Forest Park on the sheltered western shore of Sheephaven Bay. It's a 480 hectare park, but other than the tarmaced road that leads down to the coast the tracks are reserved for walkers so our views of it were a bit limited. Having said that, it was very pretty and easy ride through the rhododendron bedecked woodland, and as we had the area almost entirely to ourselves it made a lovely finish to our day. Thursday 25th May 2017 - a scorcher! Today the sun has shone from start almost to finish, so as we've been on the go almost constantly for the last 10 days (especially John who has driven over 650 miles), we've awarded ourselves a day off to sit in the sun and not do very much other than the scanning of our Kindles. However, we did rouse ourselves around mid-day to go and watch the Union Cyclists International Bike Race that passed right by our campsite. It's not quite on the scale of the Tour de France, but it's an 8 day event over 1,199 kilometres and loads of international teams take part. As you would imagine, they flashed by very quickly but it was quite exciting to see and John even won a prize! One of the riders chucked out his WIGGINS feeding bag right in front of us so in the interest of KEEPING IRELAND TIDY we had to pick it up! Today was our day for visiting Glenveagh National Park, which as usual, we did on our trusty steeds. It's one of only 6 such Parks in the whole of Ireland, and it covers 16,000 hectares of mountains, bogs, lakes and woods, and quite spectacularly, it's split in two by a valley, part of which is filled with Lough Veagh. The park is home to a number of Golden Eagles and also to one of the largest herds of purebred red deer in Ireland, and additionally, within it's limits it encompasses two of the highest mountains in Donegal - Errigal and Slieve Snacht. Therefore, as we peddled the 8 or so miles towards it over gently undulating countryside, we had very high expectations - and I'm quite happy to say, we weren't disappointed other than the fact that we didn't manage to see the above mentioned wildlife! We arrived in glorious sunshine after about an hours peddling, and our first port of call was the Visitor's Centre which provided info and a map, and then next on our agenda was finding a comfy place to stop for coffee - the head of the valley proved to be perfect! Once refreshed we took the trail that runs along side Lough Veagh, and after a couple of miles we came to Glenveagh Castle which stands atop a slight promontory jutting out into the lake. Guided tours are available but have to be pre-booked, however we were more interested in admiring the lovely gardens that were filled with loads of multi hued rhododendrons. After the castle the trail continued on, first towards a water-fall that spilled from the high cliff sides, and then further towards the Poisoned Glen, but as we went the track became a bit to rough for our bikes so in the end, after a lovely ride, we turned tail and went to find today's spectacular dining place. Finally, when we'd had enough of baking in the hot sunshine we left the park and completed our ride by making it a circular one, and heading back to the camp-site over open moorland where we saw two chaps undertaking the ancient art of cutting peat by hand. Saturday 27th May 2017 - ☔🌧🌧🌧⛈☔ - What a difference a day makes! This morning we left The Wild Atlantic Camp site and headed for the town of Dungloe - a distance of about 50 miles - all of which was completed in heavy rain which was accompanied by a good deal of mist and murk! On the way we stopped off at what is supposed to be a magnificent view point called 'Bloody Foreland' for coffee - but at the time the rain was hammering so hard on our roof we decided against getting out to take any pics! However, we did find out a bit about it! You'd think with a name like that it's history would include a 'bloody battle' or some other nasty incident - but no - it gets it's name from the red hue that the cliffs take on at sunset - but I'm fairly sure there'll be no 'displays' later today so we didn't hang about! And we did make up for our 'lazy' day yesterday! Today we deviated from the Wild Atlantic Way a bit because we 🚴 32 miles to check out two peninsulas that sit just below Dungloe - and as we went it was easy to see why this bit has been missed out! In places the roads become very rough and little more than grassy tracks, and I say that because on our travels we've seen lots of roads where grass grows down the middle, but here it was more a case of the tarmac occasionally peaking out through the grass! But that didn't matter to us because, even with the regular steep gradients we were fine on our bikes and the only thing we really missed was the company of our cycling buddies Sharon and Paul - we thought they would have loved it just as much as we did! The first part of our ride took us out towards Crohy Head and it's sea arch, and it was near here that we paused for our first break - by the time we'd done all the hills to get there we were in desperate need of replenishing our energy levels with lemon curd filled hot cross buns and coffee! And from there we proceeded around the rest of the 'Na Rosa' (that's Irish for a piece of land that juts out into the sea) admiring not just the coastal views, but also some of the 130 lakes that this area has. Then next came Dooey Beach which we found on today's second peninsula and it was the place we'd earmarked for our lunch stop. The beautiful white sand beach lies opposite Gweebarra Bay, and it's 3km length is only accessible from a little car park that lies at the bottom of a hill, and from there you have to walk along a board walk for about 100 metres before descending some steep sandy steps onto the beach itself. However, we didn't know about the steps! So we gallantly descended the hill and then pushed our bikes along the board walk - but only to be halted by the steps which it was impossible to get our heavy bikes down. Therefore, our only option was to return the way we'd come - the only problem with that was the fenced in boardwalk was too narrow for us to turn our bikes round - so we quite comically ended up reversing them for the full 100 metres - I think we probably looked a proper pair of chumps! Once back in the little car park we debated what to do next because we were more than ready for our dinner, but with no view to look at we didn't want to eat where we were. No problem! We just hopped back on our bikes, applied turbo mode and scooted back up the hill to find a grassy verge overlooking the bay which proved to be quite comfy while we munched our sarnies! Once our meal was complete we started the homeward leg of our journey through more rocky lake and rhododendron filled moorland, and as we went we chatted about where our next destination should be - and as I'm writing this our target is still undecided - so to find out you'll have to read my next episode!